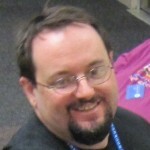 Present a session at KansasFest 2012! I disagree about the remark made later in the show that an Apple II or II Plus machine really isn’t useful these days and that it’s better off as a collectible item. I set up my Apple II Plus a day or two ago. It has just a Disk II controller, Language Card, and Videx 80-columns adapter. I have so far been able to play all of the games that I wanted out of the games disk bin. Some of these games are newer, from 1985 or 1984, and they play just fine on the II Plus, no complaints. Thanks for the comment. You aren’t going to be able to accomplish as much with an early, unmodified Apple II as you are with a later model in the Apple II line, which is all I was trying to point out. Thanks for listening and for commenting!